Petroleum: a primer for Kansas is the story behind the techniques, philosophies, and struggles of finding oil and gas in Kansas. It is written in non-technical language for those who have interests in the petroleum industry in one way or another, but who have had little or no training in the technical fields involved. Dr. Lee C. Gerhard, State Geologist and Director of the Kansas Geological Survey, suggested this project. This book is based on a similar publication of the North Dakota Geological Survey by Erling Brostuen, published when Dr. Gerhard was State Geologist of North Dakota. The North Dakota Geological Survey kindly gave permission to excerpt portions of that book. The sections on petroleum, geology of petroleum, exploration, and subsurface geology were written by D. L. Baars; the section on petroleum geology of Kansas was written by W. Lynn Watney; and the sections on geophysical exploration were written by Don W. Steeples, all of the Kansas Geological Survey. The sections on mineral rights and leasing, drilling the well, and production are only slightly modified from Erling Brostuen's book. Others helped prepare this book. Bryan Stephens made the high-quality thin sections for fig. 2A-D and assisted with fig. 9. John French assisted with the data analysis for figs. 10 and 11, and Jan Chung Wong generated the maps using Surface III. K. David Newell allowed us to use fig. 14. 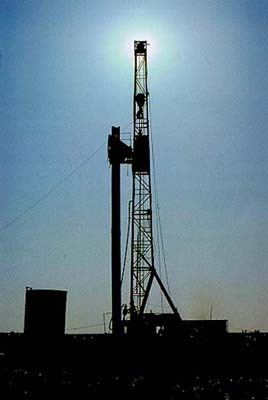 John C. Davis took the cover photograph of a drilling rig in Rawlins County. Jennifer Sims designed the cover of the book and drafted some of the figures. Fred Terry edited the manuscript and designed the page layout. Most importantly, Dr. Gerhard has patiently and helpfully supported the compilation and production of this book and has contributed many excellent suggestions. Placed online April 2001. Originally printed 1989, revised and reprinted 1993. Available as Educational Series 7 (please see the KGS Publication Catalog).